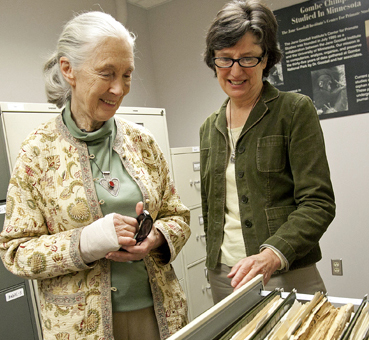 The Jane Goodall Institute Research Center, managed by Duke Professor Anne Pusey, is an archive of dawn-to-dusk observations containing the complete life histories of more than 200 chimpanzees at the Gombe National Park in Tanzania. That data was collected by British primatologist Jane Goodall over more than 50 years and is made up of original handwritten and typed field notes. A major activity of the archive curation is the computerization of systematically collected daily data and incorporating it with related material into a relational database for scientific analysis. Duke Professor Anne Pusey, who has worked with Goodall at Gombe for more than 20 years, is the data curator.